The Beautiful Game is in focus as the world eyeballs the FIFA World Cup, this time in Russia. The opening ceremony was brief, and surprising in more ways than one. The FIFA World Cup 2018 was kicked off in Moscow with a dazzling opening ceremony at the Luzhniki Stadium, before the first match between host Russia and Saudi Arabia. The 15-minute show, Reuters reported, was produced by Russia’s state Channel One. The ceremony reportedly broke from tradition, focusing on musical acts including a performance of Pyotr Tchaikovsky in front of full stands. The report said that Iker Casillas and Russian supermodel and philanthropist Natalia Vodianova brought the World Cup trophy onto the pitch in a Louis Vuitton travel case. 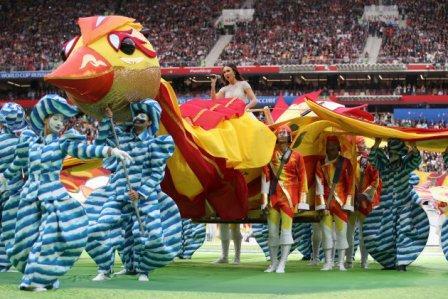 Ronaldo, Aida Garifullina, “kid,” Zabivaka (Russia 2018 mascot, for the uninitiated), Telstar 18, lots of background dancers and colours and finally, Robbie Williams. ( By now most of you must have heard that he showed his middle finger towards the end of his performance… why? .. go figure!) 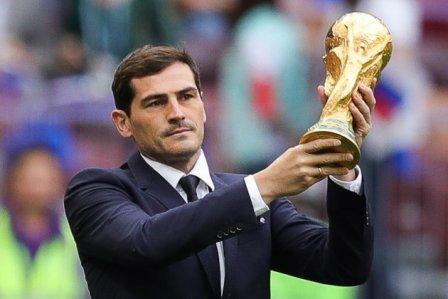 Thus stood the star cast of a rather hasty opening ceremony for the 2018 FIFA World Cup. The supporting cast included pianist Daniil Trifonov and violinist Yuri Bashmet, who were both floating over Moscow river while performing a Tchaikovsky composition in a rather bizarre pre-recorded opening video. Denis Cheryshev struck twice for Russia as the World Cup host thumped Saudi Arabia 5-0 in the opening match of the tournament in Moscow on Thursday. Artem Dzuyba netted a third before terrific late efforts from Cheryshev and Aleksandr Golovin wrapped up Russia’s first win since October to launch its Group A campaign in style. Russia headed into the curtain-raiser at the 80,000-capacity Luzhniki, the crucible of Russian and Soviet sport, without a victory in over eight months and ranked a lowly 70th in the world. Russia lost Dzagoev to a hamstring injury midway through the first half and his replacement, former Real Madrid winger Cheryshev, celebrated his recent recall to the national side with Russia’s second goal two minutes before half-time. Substitute Dzyuba struck by heading another Golovin cross beyond a helpless Muaiouf in the 71st minute. Russia 5 (Yuri Gazinskiy 12, Denis Cheryshev 43 & 90+1, Artem Dzyuba 71, Aleksandr Golovin 90+4) bt Saudi Arabia 0.